SCVHistory.com GZ0404 | Newhall | 11th Annual Christmas Storybook Parade, 12-8-1973. 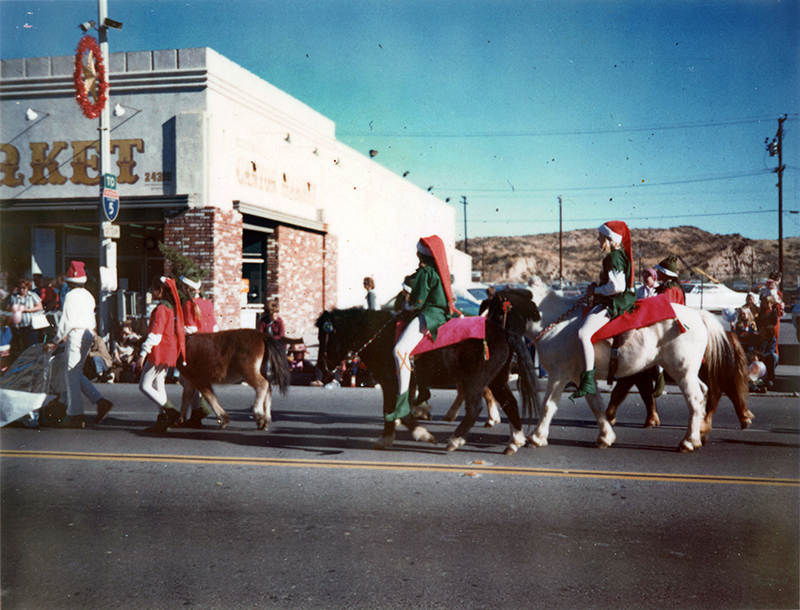 December 8, 1973 — 11th Annual Newhall Christmas Storybook Parade. Leticia Marie Thomas is riding the white pony at right, and her cousin Sherri Diaz Melville is on the black pony in the middle. They lived at the Balsz Ranch in Honby. According to Leticia Thomas (pers. comm. 2017), the people in this photo are (from left): Clay Lilley in front with Michael Langer [in wagon/sleigh], Diane Grimmer, Sherrie Diaz Melville, Dina Diaz Sandel, Laura Thomas Herron, Veronica Thomas Baggett and Leticia Thomas. "The Diaz girls have another younger sister named Dalina who was 4 years old at the time and couldn't walk the parade route." The Diaz girls are granddaughters of Charles Chacanaca. Visible in the background is a portion of Dillenbeck's Newhall Market at 24316 San Fernando Road. Dillenbeck's was previously Safeway and was followed by Tresierra Market. This section of San Fernando Road was previously named Spruce Street and became Main Street in 2007. GZ0404: 9600 dpi jpeg from original photograph; online image only.